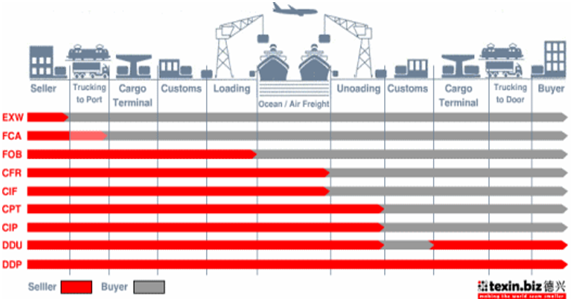 Doing the business as oversea sourcing and selling, we have to refer to the Incoterms (international Commerce Terms), meanwhile there are a lot of terminology of international trade to be grasped before operate the foreign trade. I have specified some popular terms of international trade last time as EXW, FOB, CFR and CIF. By this time I will explain others so that we may know these terms completely. So according to the Capital letter of terms, we divide these terms into some group, such as D group, C group and F group. By this time let us know about terminology of D group. DAT, Delivered At Terminal. What difference between DAT and DAP? Normally DAT term will be in charge of delivery of goods to the destination port. DAP term will require sellers to ship and deliver the goods to the specified destination, for example buyers factory, warehouses or so on, the distance of shipment is more far than DAT. Another different point between two terms, under DAT the sellers have to arrange to unload the goods, then in terms of DAP the sellers have no duty to unload the goods. This term is suitable for all kinds of ways of transport. DAT, Delivery at Place. This term is suitable for see, inland waterway and land transport. However sellers have to pay all charges as well as delivery to the buyers specified destination will be arranged by the sellers. Meanwhile, import duty and tax will be paid by the buyer at the destination which receive the goods. Related customs clearances fee should depend on the agreement of the freight booking and see whether sellers or buyers to pay according this agreement. DDP, Delivered Duty Paid. This term is suitable for any kinds of transport way no matter sea, inland waterway or land. Normally by this term seller or shipper will deliver the goods to the specified destination in import country, and have to bear all charges and risks which shipping the goods to the specified destination, then transaction of customs clearances of import is also needed by sellers. So normally for the first deal between suppliers and oversea buyers, seldom the sellers will accept this term for their business. Even though a long term old customers, generally factories also are not willing to adopt this term because of high risk of receiving payment of goods. Click here for more International Trade Information.